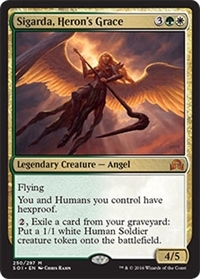 It's aegis (who is much cheaper) + kira (also cheaper, and wider effect) with a good body and a token generator. The cost is high for a Humans deck, maybe too high, but the effects are awesome. If you are playing Noble hierarch and or deathrite shaman is easier to ramp into it, while it could be unacceptable in mana denial strategies. I like her. I wish she was 2GW with 3/4 p/t instead, but even where she is I could see her being played. One would just have to center their deck around a little more ramp is all. I like this a lot despite not having hexproof itself. Maybe a "win-more" for Mentor Decks but real nice for anything with Deathrite and Thalia. That's quite a large hatebear! Thing is Dromoka found it's place in big mana control decks, not in humans. I doubt Sigarda will have the same impact. She doesn't protect herself, and hexproof to you is just too late at 5 mana to screw Tendrils or Cabal Therapy. The only good thing for her is horizontal growth, but even then 2 mana is probably too much and it messes up your graveyard for delve spells or Jace/Snapcaster. Is there any way it works in Oath as sb tech for the mirror and storm? If you Oath first, your opponent can't Oath you and you can keep going. Same for storm. May not be better than Griselbrand necessarily. May be worth a playtest or two in a B. Kelly style Oath list? It IS eminently castable. This board says: "Read and talk about playing strategy to improve your game." It does function that way. But I just can't help but think Oath can do better than a 4/5 flier. In a vacuum this would be good. But in a field with so many other choices its good, but not good enough.